FDCCI, Federal Data Center Consolidation Initiative, initially started by Executive Order 13514, is now being promoted as the framework for new laws that will be created to get a better handle on data center inventory, asset management, capacity planning, capacity management, and overall data center efficiency. Great overview of some of the big bets been made on energy sustainability and smart grid by a group of brilliant investors. While CIO.gov has recently updated the UI/UX of the cio.gov site, several links have become broken and a lot of, once up to date, content is now deprecated. An example of this is the FDCCI Public Plans and Progress Reports by Agency. These reports have not been updated since 2011 and from reading many agency reports, it’s clear that there are some challenges as yet to be addressed. An example of this is the cost estimates reported to congress for operating Federal Data Centers (something that requires larger and larger budgets) and the value of data center consolidation which seems to result in very little progress being made and very little desire to continue to invest in an area largely seen as un-funded mandates. PUE targets, now at a 1.4 Target by OMB, have been largely misreported without access or ability to report live PUE measurements. Even agencies that began the process seem to have rolled back to spreadsheet based ‘guesstimates’ in terms of actual utilization of applications, missions, and projects (or programs) tied to IT assets. Additionally, while consolidation was originally starting with an estimated 3,000 data centers, we now have uncovered an additional 3,000 data centers, bringing the total to roughly 6,000 data centers. Live reporting of PUE level 3 or ultimately CADE is essential to measuring the current state of federal data centers and also to prevent good people from gaming PUE to meet the mandates (which can cost taxpayers an added $1.5B next year). “We’re three years into the data center consolidation effort, and the government still does not know how many centers it has,” said David Powner, director of Information technology management at the Government Accountability Office. 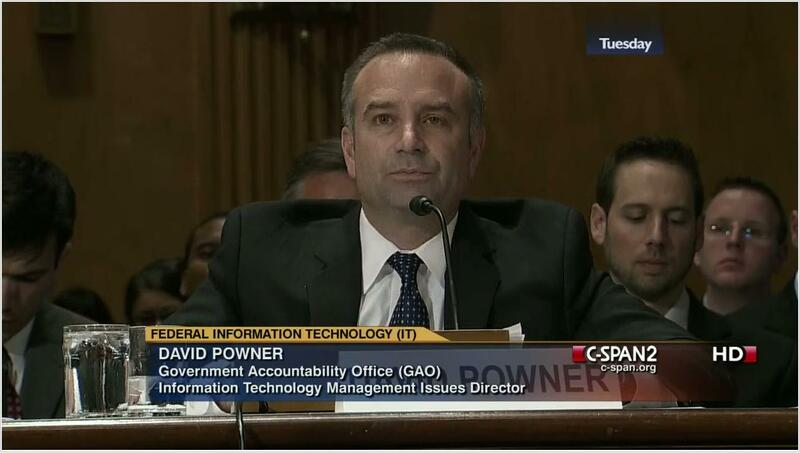 David Powner testified Tuesday at a Senate hearing on IT duplication across government.